Jiminy crismas, where the heck do I sign up? I would give good money for a garden center populated with something other than marigolds, petunias and sullen/ignorant salespeople. Whew, I hear you on that! I am so very sick of the same old, same old. YES! Sign me up – that place looks looks pretty close to Heaven to me. 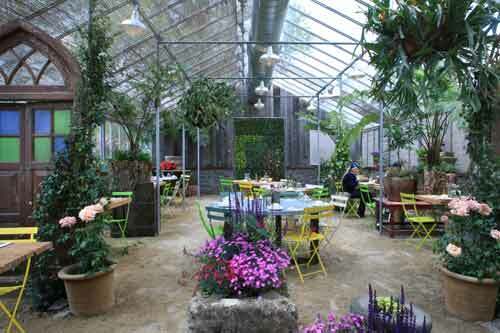 While I have a number of garden centers with more than big box selection, that place has style! I’d love to see one anywhere in the Baltimore/DC metro area – if I’m willing to drive for an hour to get to Surreybrooke, I’d certainly drive an hour to get to Terrain. If you’re around here are you familiar with Homestead Gardens in Davidsonville? It’s not far from Annapolis. 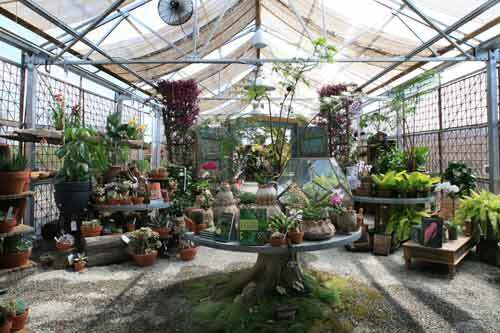 They have an absolutely fabulous selection of plants that they grow on their own farm. I’m headed there next week for a visit to see the farm for myself. I’m up for the road trip. Problem is, I couldn’t haul much back home! Wish we had more centers like that. We do have a nice selection of local nurseries with garden decor, which I love, for helping us make our areas into garden “rooms” with both plants and STUFF! In fact, I think the shopping part of gardening is almost as much fun as the gardening part … digging, sweating, hauling, weeding. Wait. Shopping or THAT? Maybe it’s ALL about the shopping! Or at least the collecting. Years ago, Anthropologie and Urban Outfitters branched out from clothing to furnishings. At that point, the stores I used to go to in order to find those unique items became untouchable, price-wise and way too trendy. I fear the same will happen. Both the plants and the accessories that surround them will be very expensive. We’re lucky in the DC area to have a number of independent nurseries that sell specialty and native plants and herbs. We also have a number of antique sellers and local craftsmen from which to find our garden furniture and accessories. And some things are hard to find. Rain chains, anyone? Native bog plants? Stone garden benches that don’t look hokey? If Terrain can provide that, all the better for us. this sounds like a great place, especially if they have staff that actually know something about plants. I stopped at a garden center yesterday and not only did most of the big potted plants of the Proven Winner types look really sad, dried out and gone by, they had only the most common of plants. I was willing to spend money, but not there. Fascinating…I see a bit of this at one local nursery but nothing like this magnitude. I miss the variety of perennials, natives and interesting annuals that local nurseries used to carry, I guess they can’t compete with big box stores. I’m with suzq if this store can carry the new, the unusual and the un-hokey…then please move in to my neighborhood. Wow! Lucky you for having something within reach like this. Our best bet is the farmers market, which sets up in a remote part of the mall parking lot. Enough said, huh! Actually, we do have one really nice nursery around here, and it is very popular. But nothing with the selection like this. Looks impressive. I am heading to PA on a road trip shortly. Maybe I should check that place out! Terrain reminds me a bit of the Hort Couture branded plants I discovered this spring. They’re not trying to redesign whole garden centers, just lend some merchandising panache through their plants and displays. I know of a few interesting garden centers in Virginia, but not as aggressively hip as Terrain looks to be. Have you been to any of Smith and Hawken stores in the DC area? I haven’t, but I would guess they’re targeting an older demographic than Terrain. Robin, too bad we don’t live closer, as I am always ready for a road trip…What did you buy?